Author Graham Harvey writes for the Telegraph and the Guardian and he is the Agricultural Editor of BBC Radio 4. Briefly explained, We Want Real Food, 2008, (Constable) is about how our soils, thanks to the way we now run our farms, are lacking important chemical components such as Nitrogen, Phosphorous and Potassium. This, says Harvey, is “a big issue” and not nearly as widely debated as it should be. As a direct result of the lack of nutrients in the soils, both the vegetables and grains we eat as well as the grains fed to the animals we eat have a much lower nutritional value than they had some 50 years ago. This, claims the author, results in meat, eggs, milk and cheeses with poor nutritional value. Naturally, as a figure right at the top of this ever weakening food chain, this affects you. The author links this, with back-up from many studies, to the increase of diseases such as cancer and heart disease. That is, of course, if you believe that what Harvey implies is true. In my opinion, with all the extensive research he presents, it is hard not to. What is really good about We Want Real Food is that it doesn’t stop with highlighting an issue Harvey says our politicians are trying to keep from us (you will have to read the book to indulge further in this). It comes with solutions. Almost half the 300-odd pages are filled with a detailed yet easily glanced list of what foods to eat and avoid. There is also an extensive list of farms which are still keeping a more traditional way of farming, and of farmers markets where you can buy their foods. 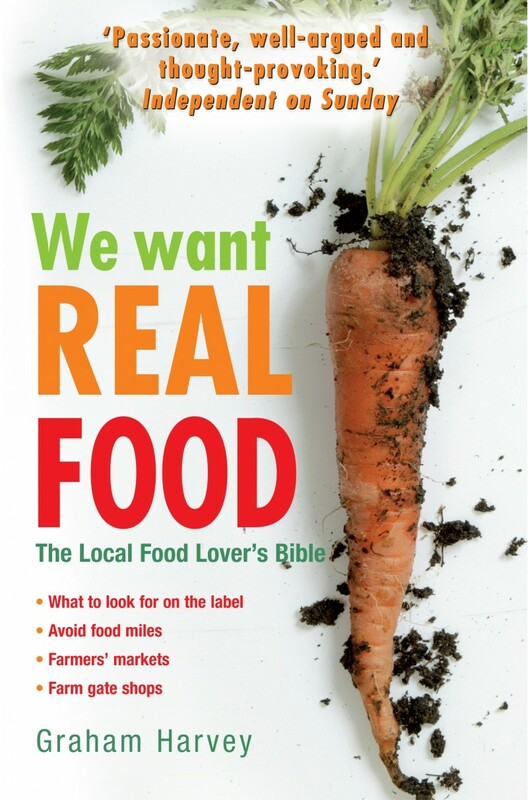 We Want Real Food, as good as its message might be, is a rather difficult read at times. The language can be hard to follow as the author explains the biology and chemistry in great detail. A reader without a degree in these subjects, might find their eyes glazing over as the technical terms go on. In all fairness, a book like this could not have proved its point without putting the proof out there for scrutiny. Every single argument is backed-up by studies and facts. It is clear that extensive research has gone in to the writing of this book. Graham Harvey shows wide knowledge and a great enthusiasm of the subject which makes We Want Real Food a joy to read as his passion really shines through. This is a great book, get two copies – one for yourself and one to send off to your local council. ← COMMENT: ‘Pimp my Blog’ panel debate at City University, will expressing your opinion as a journalism student narrow your future chances?